Premium HID Lamps from one of the most respected names in the business. Philips HPI-T lamps are Metal Halide, outputting blue-white light which is most suited to vegetative plant growth. Philips Son-T Plus lamps are High Pressure Sodium, outputting yellow-orange light which is most suited to flowering and fruiting. Philips Son-T Agro lamps are also High Pressure Sodium, but put out an unusual amount of light at the blue end of the spectrum for an HPS lamp, making them particularly effective as an all-rounder. Philips Son-T Agro lamps have been replaced by the Son-T Greenpower lamp. 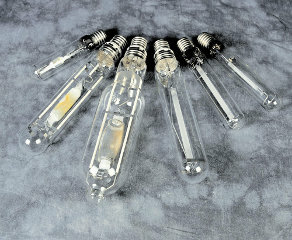 This HPS bulb produces dual spectrum light (cool & warm), and can be used throughout the grow and bloom stages. Supplied in 400W (58,500 lumens) and 600W (90,000 lumens).